Olympic torch relay aims to raise Canadian pride – WHO IS ANDREA KITAY? Relay will feature over 12,000 torchbearers and last over 100 days. The Olympic torch relay for the Vancouver 2010 Winter Olympics is expected to hit Toronto Dec. 17 and 18. “The Olympic flame will be within one hour drive of 90 per cent of the [Canadian] population. Everybody can get close to the flame if they want to,” said Duncan Ross, senior executive advisor of major international events and special projects for the city of Toronto. The relay will also help bring about a tremendous sense of national pride, Ross said. In addition, because the flame is going to be reaching smaller communities that might not get the chance to feel so close to the Olympics, a sense of togetherness will be felt, planners believe. Case Ootes, councillor of ward 29, Toronto-Danforth, said by having the relay pass Toronto landmarks it can increase the city’s presence on an international platform. 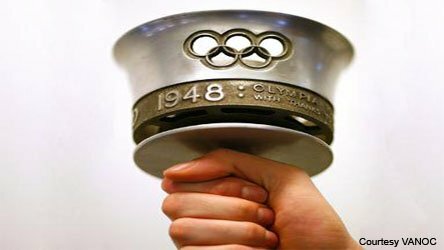 According to Jim Richards, director of torch relays for the Vancouver Organizing Committee for the 2010 games, the relay and ultimately the Olympics is all a part of building a legacy of a better Canada. The torch will travel from Victoria all the way back to Vancouver, finishing on Feb. 12. Expecting to travel to 1,020 communities nationwide the relay will also stop twice a day for short celebrations along the way.